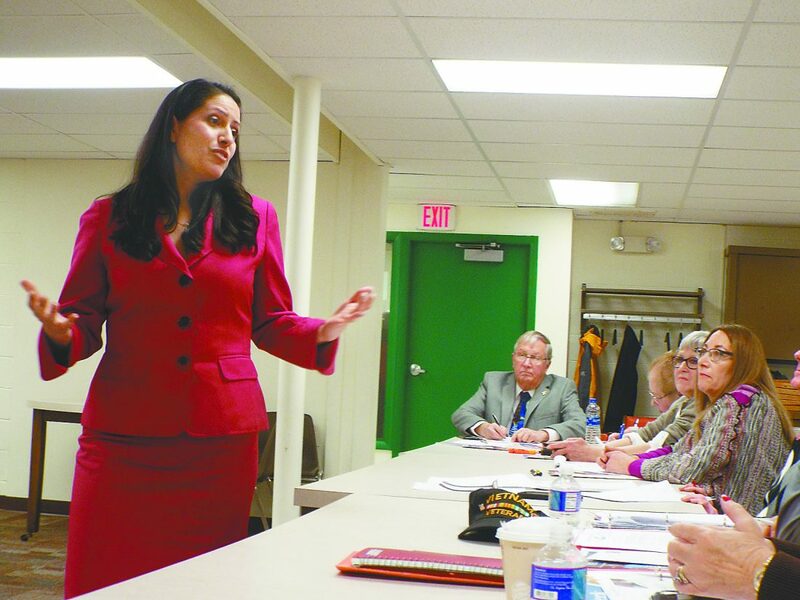 LEWISTOWN–Potential Republican nominees for the 12th Congressional District seat had the opportunity to speak during a meeting with the Mifflin County Republican Committee on Tuesday evening at the Mifflin County Library. Just after beginning his fifth term in Congress in January, Representative Tom Marino announced his resignation, citing his desire to pursue a job within the private sector. Since then, several potential candidates have stepped forward to express interest in filling Marino’s seat until January 2021, including Democratic nominee Marc Friedenberg, who originally lost the congressional seat to Marino in May 2018. In order to select a Republican Party candidate, the GOP is relying on conferees to make the decision, some of which were present during Tuesday night’s meeting. ¯Pat Miller, of Centre County. ¯Chris Hoffman, of Juniata County. ¯Jessica Bowman-Hosley, of Clinton County. ¯Malcolm Derk, of Snyder County. ¯Doug McLinko, of Bradford County. ¯Joseph Moralez, of Northumberland County. ¯Jeff Wheeland, of Lycoming County. ¯Stacy Garrity, of Bradford County. ¯Joe Peters, of Wyoming County. ¯Fred Keller, of Snyder County. ¯Robert Noerr, of Clarion County. ¯Maria Montero, of Lycoming County. ¯Kevin Ferrara, of Clinton County. ¯Dr. Davis Haire, of Wyoming County. Others that were originally slated to speak, but were unable to attend due to scheduling reasons are Bobby Jeffries, of Dauphin County, Chuck Risio, of Centre County and Matthew Timm, of Susquehanna County. Each candidate had the opportunity to introduce themselves before being asked a series of four questions pertaining deficits, politicians whose views they align with, what they consider to be the biggest concern facing the 12th Congressional District, how they will maintain their values if elected and how they plan to address Democratic opposition. Several of the potential candidates echoed similar views and approaches to key issues in Washington D.C. Both Keller and Haire cited their admiration of President Ronald Reagan and how they try to model their work after his views. Additionally, candidates such as Miller, Bowman-Hosley, Derk, Garrity and Noerr agreed that the best way to face Democratic opposition was to let the Democratic party speak for themselves. “We have to be civil when we’re addressing them, we’re not just addressing Sanders or Cortez, we’re addressing the people that voted for them,” Noerr stated. Addressing reduction of the deficit, Montero said, “The first thing I want to start with is the Department of Education. Right now we have a lot of loaded agencies that, quite frankly, don’t serve us justice. When it comes from an education perspective, I think it should be at a local level.” Montero also noted an environmental standpoint and how farmers frequently experience negative impacts from government regulations and expenditures. The Republican nominee is slated to be selected and announced this Saturday, March 2, and will face off against Friedenberg during a special election on May 21.